Show your viewers the stars with these out of this world babies! The Milky Way has never looked so good! 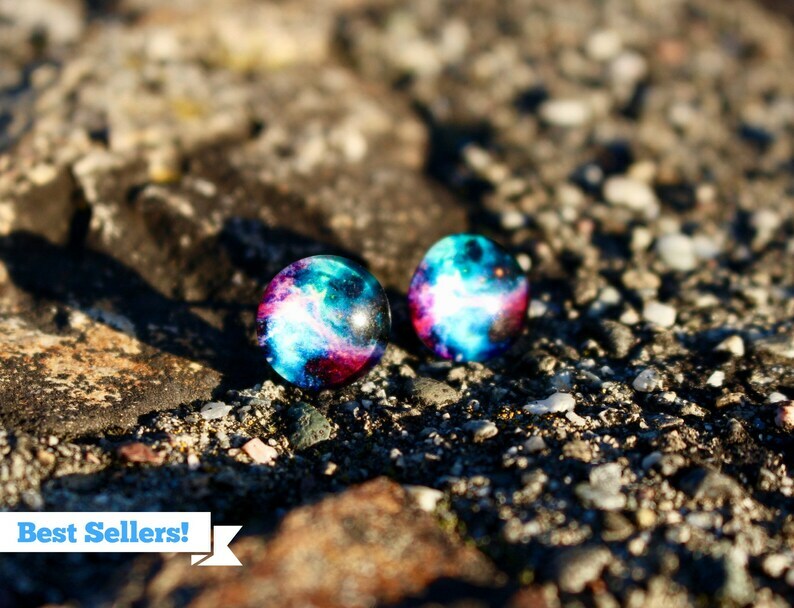 Awesome, bright, purple, blue and white Galaxy stud earrings are high quality glass and the photos are rich and vibrant, with excellent detail! They are 12mm and mounted on pure titanium posts, the pad is surgical stainless steel and the ear nut is plastic, so everything is hypo allergenic! We are passionate about hypo allergenic because our owner has ears just as sensitive as you! There is nothing worse than to find a CUTE pair of earrings that make your ears itch and burn! We hope these give you NO issues! I'm a bit of a space case, so I love the look of these! My ears are healing up from an allergic eczema a different pair I own caused, so hopefully these won't cause it to flare back up. Free earrings were included, which was a nice surprise! I knocked a star off for a fairly bent post on one earring. Not sure if that's just how titanium behaves or if it was damaged during shipping, but it makes me worry that the metal has weakened some and could break off one day while I'm trying to take them out of put them back in.